EcoAir DD122FW Classic mk5 Review - Why Is It So Popular? 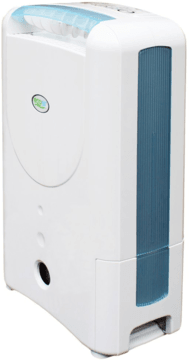 The EcoAir DD122FW Classic MK5 is, in our opinion, the best desiccant dehumidifier available and rightfully one of the most popular models in the UK. In terms of features the EcoAir DD122FW Classic is as feature-laden as dehumidifiers come. If we work through the easy to operate, soft-touch electronic control panel the first button is the ioniser, which negatively charges larger air particles. This causes bacteria, mould spores and other allergens to attract to each other and fall out of the air or attract to surfaces where they can be easily removed through normal cleaning. Ionisers are also said to be good for general well-being and while some would argue with this, the benefits to the cleanliness of the home environment are proven and so a great feature to see on this model. While we’re talking about air purification, it’s also important to note that the DD122FW comes with a anti-bacterial silver filter, which is a fine mesh that should kill bacterial and other allergens upon contact. Next is the timer button, which allows you to set the timer for either 2, 4 or 8 hours after which the machine will turn itself off. We find this feature most useful when accompanied with the laundry/ boost mode as a means of conserving energy. For example, with the dehumidifier near to laundry it may only take a couple of hours to dry, so if you’re out for the day you can save energy by also employing the timer feature. I wouldn’t recommend that you use the timers with the standard automatic dehumidifying settings, because the machine will already be turning itself on and off through the inbuilt humidistat. EcoAir make a lot of their ‘3D louvre technology’ and to be fair to them they are market-leading in this area. Through the control panel you can set the louvre to swing in either a ‘wide’, ‘up’ or ‘front’ direction and there’s further customisation available by turning a cog at the side of the louvre to give a ‘wide’ or ‘spot’ airflow, which is great for targeting patches of mould. Most other dehumidifiers on the market simply push the outflow air into a single direction, with no swinging ability and at the absolute best have a manual flap to direct the air, so EcoAir with the DD122FW Classic really are streaks ahead in this area. The DD122FW Classic comes with two ‘laundry’ modes, which you could also read as ‘boost’ modes. Both modes essentially turn off the humidistat and just keep the dehumidifier running whatever the humidity of the environment. For this reason you should look to employ the timer settings alongside this mode for normal situations and keep the mode on for a couple of days maximum for, say, drying out a very damp room or you risk damaging the machine. The two settings are ‘laundry quick’ and ‘laundry normal’, the only difference being ‘laundry quick’ mode has the machine running at absolute maximum, ‘laundry normal’ mode throttles back the power somewhat. For drying laundry, giving a boost after a long shower or for targeting a certain damp room these settings are very useful. Next are the standard dehumidifying settings, with the two-droplet ‘Hi’ setting taking the room to 45% relative humidity, which is towards the dryer end of the ideal scale (best for when it’s <5°C outside) and lower than many other dehumidifiers are seemingly able. The one-droplet 'Economy' setting works towards 55% relative humidity and only uses the fan on economy speed. This is the setting I'd recommend you keep the unit on almost permanently (aside from laundry drying), at least until it gets really cold outside when you could drop down to the 'Hi' setting. The third setting we'd see on other dehumidifiers is typically an 80% humidity setting, which is totally useless at UK temperatures, but thankfully EcoAir have used their brains and instead have an 'Auto' setting. This is essentially a cross between the two previous modes, by working to towards 55% relative humidity, but employing a combination of the economy and normal fan speeds to offer economy, but also offer quicker drying when you need it (i.e. after cooking or showering). With all these settings, when the target humidity is reached the DD122FW will turn it's dehumidifying parts off, but keep the fans and ioniser running to continue to purify the air and to keep monitoring the humidity, so called 'E7' technology, but nothing out of the ordinary. Also on the control panel is the on/off button, a warning light (e.g. the bucket hasn’t been pushed back in correctly) and a light that illuminates when the collection tank is full. There’s also a viewing port on the front of the DD122FW so that you can see how full it is at any one time without removing the bucket. The collection bucket is 2 litres, which while not particularly big is the standard size for a dehumidifier of this power. What we liked about the collection bucket is the side access, carry handle and a lid to stop any spillage as you’re tottering with it to the nearest sink. Of course you wouldn’t need the collection bucket at all if you’re able to site the dehumidifier near to a sink as there’s an auto-drain option using the pipe that EcoAir kindly provide in the box. 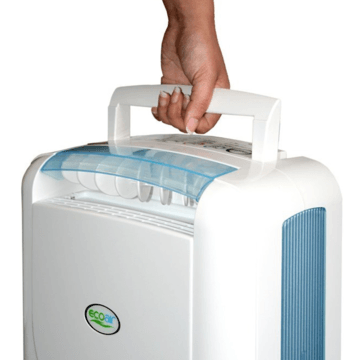 At 6kg when out of the box, the DD122FW is a featherweight dehumidifier, which you’d expect of a desiccant model. It’s not quite the lightest available, but I wouldn’t be able to tell the difference. It is also narrow and fairly thin, with dimensions of 17.5cm deep by 29cm wide by 47.5cm high. This makes it easier to hide away and suitable for cramped areas found in sheds, boats and caravans. The narrow dimensions, lightness of weight and top-mounted carry handle make it a breeze to carry on those infrequent occasions that you need to move the machine. The EcoAir DD122FW Classic is undoubtedly well-designed from a functional perspective. The control panel is easy to access and use, the carry handle is ergonomically designed, there’s a viewing window into the collection bucket on the front of the machine (with many dehumidifiers this is on the back) and the bucket is accessible from the side (again, many machines have this on the back). However it does seem that the design is a little function over form as the expanses of white, flat plastic and the dated blue side panels make this unit not particularly attractive, but this is clearly a personal opinion only. Producing just 34dB of noise on ‘Economy’ mode (i.e. 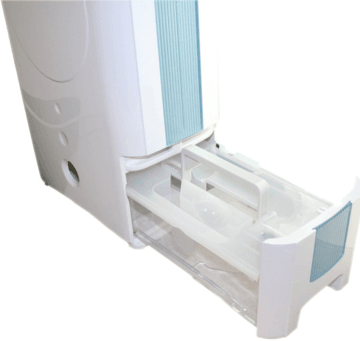 lowest fan speed), this dehumidifier is just about the quietest dehumidifier on the market. Clearly, not having the compressor of refrigerant dehumidifiers makes a difference as it only becomes the fans that are audible (one to blow ‘wet’ air on to the desiccant material, another to blow hot air on to the desiccant material to dry it). On ‘Economy’ mode it is very quiet, and I wouldn’t have a problem with this being on in the room we watch television or bedroom. It is more noisy when the fans are working harder, for example on laundry mode, but to be honest I’m not to worried about that as when you need it to be quiet you can just switch it back to ‘Economy’ mode. Historically, desiccant dehumidifiers were never as powerful as refrigerant models, however with modern quality desiccant machines such the DD122FW this gap is essentially non-existent within the domestic environment. One of the major complaints about the DD122FW and many desiccant dehumidifiers for that matter is that they can produce a burning smell early on, in exactly the same way as an electric heater turned on for the first time does. This is almost unavoidable with this technology as the machine has to evaporate water from the desiccant material. So you should expect this smell for the first few days, with it improving gradually from then. 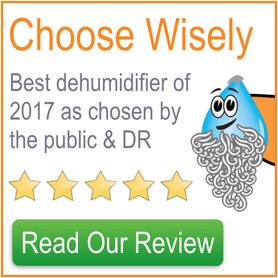 One thing to be careful of when comparing the extraction rates of dehumidifiers is the conditions under which they were measured. EcoAir quote that the DD122FW extracts 7 litres per day at 20°C and 60% relative humidity, which compared to some units that are stated to be 10, 12, 16 or even 20 litres per day seem small. However, these extraction rates are normally measured by manufacturers at 30°C and 80% humidity, which wildly exaggerates the extraction rates that they are capable of with standard UK conditions, so hats off to EcoAir here for their honesty. In fact, when you dig deeper into the DD122FW, the figures are very impressive. It performs like you’d expect a 16L to 20L per day unit to perform, which makes this small, desiccant unit much more powerful than you’d expect and suitable for homes that are up to four bedrooms. We love the DD122FW Classic and prefer it to the DD122FW Simple as you don’t have to compromise on any features. It’s surprisingly powerful and very quiet and is the best desiccant dehumidifier on the market. Just make sure you buy the MK5 model, not the MK4 model and thankfully after spending most of November and December 2014 out of stock it’s now back in and with free delivery at this store, so it may be worth grabbing it while you can. I’m still not convinced by these desiccant dehumidifiers, I’ve always had the refrigeration type and they’ve been very reliable. If it ain’t broke don’t fix it! Really helpful review. From this and others I bought one. I even printed the review as instructions for my parents…. many thanks! Thanks for the encouragement Dylan, your feedback has cheered me up no end! Great choice of dehumidifier. Thanks for the reviews. I have just ordered this dehumidifier and am looking forward to it’s arrival. I have read tons of reviews and this one seems to have consistently good feedback. Thanks again! A very through review, but is the EcoAir DD122FW Classic suitable for use in a workshop that has been flooded through a burst pipe? Hi Sue, it sounds like you’re going to need a heavy-duty dehumidifier. When a burst pipe and severe flooding has taken place inside the home, I’d recommend going with a refrigerant dehumidifier like the EcoAir DC202 as these take to being hammered day in day out well. For a workshop it would depend how warm it is. If it’s warm (say, always over 8-10°C), then a refrigerant dehumidifier could be a smart choice. If it’s colder then the DD122FW or its more powerful bigger brother, the DD322FW would be the one to go for. Whichever one you choose, turning up the heating and draught proofing the workshop would be a good idea to dry it out faster. Hope that helps. 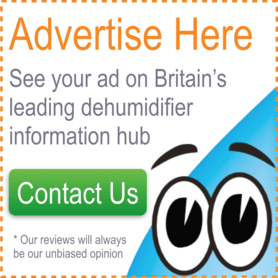 Looking for a dehumidifier for a 1 bedroom flat where there is a significant condensation problem in the bedroom. Is this model too much for a 1 bedroom flat or would a smaller model suffice? Hello Raj, this machine definitely wouldn’t be ‘too much’ for your flat. Depending on the levels of humidity/ condensation you could consider the DD122 mini, which extracts 6 litres per day, but it’s hardly any cheaper and has less features, so I’d say go for this one. Thanks for getting in touch! Hi John, looking at my instruction manual it says that the continuous drainage option requires a tube with a 12mm inner diameter. at the end of your review it says “make sure you buy the mk 5 not the mk4 model , please can you tell me why ? what are the differences . Hello Hera, you’re right to ask the question as on the face of it there aren’t many differences between the mk4 and mk5 models. The reason I say to go for the mk5 at the end of the review is because, while I have never experienced this, some people apparently had reliability issues with the mk4 model. Thanks for your question! Hi just wanted to say thanks I read this review at the weekend and ordered one from appliances direct first thing Sunday for a bargain price of £164.99 Inc delivery . I received it on Tuesday morning , and I now have a usable workroom again . It’s so quiet and my room smells so much fresher and warmer and the amount of water it’s pulled out is amazing, it works very well in cold rooms too as mine is in a single brick extension it’s very cold . I would highly recommend this product to anyone with a condensation problem. Really helpful review. Ours has just arrived to our condensation prone old terraced house. The laundry mode is going to be a huge help over winter too. What are the running costs compared to the refrigeration type?.